Level - Website of the open source Sokoban game JSoko. Opens a file chooser for loading a level. However, you can switch the file type to see all files. 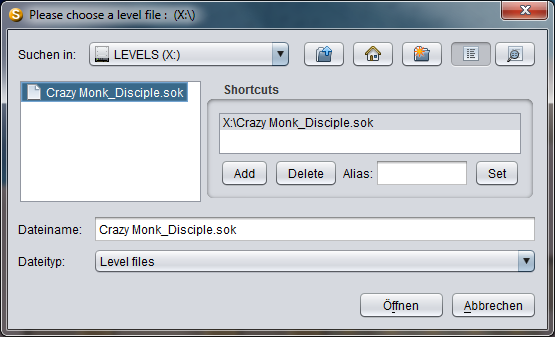 If there are files you often load you can create a shortcut: select the file (in the example screenshot the file "Crazy Monk_Disciple.sok" is selected) and then press the "Add" button. This saves a short cut to the file. The next time you want to load the file, you simply click on the shortcut to select the corresponding file for loading. You can rename the shortcut: select the shortcut to be renamed, type the new name in the "Alias" text field and press the "Set" button. The following colors can be used: blue, cyan, gray, green, magenta, orange, pink, red, teal and yellow. Imports level data from the clipboard and loads the imported levels for playing. Saves the current level into the file it was loaded from. This menu item is only enabled if the level has previously been saved using the "Save level as..." menu item. Note: only the current level is saved to the file, not the whole collection! Opens a file chooser like the one shown above. You can save the level as any other normal file. Saves the current level collection to hard disk. The collection data (title, comment, ...) and all level data are saved to hard disk in one file. Exports the level to the clipboard. Note: only the core level (without title, author, ...) is exported. Additionally, the following is exported to the clipboard: If the level is in the start position (the player hasn't yet moved at all) all solutions are exported. If the player has already moved only the current move history is saved. Exports the level to the clipboard using run length encoding. Run length encoded data is shorter than the normal data and can therefore used for instance to send the data in a text message. Note: only the core level (without title, author, ...) is exported. Additionally, the following is exported to the clipboard: If the level is in the start position (the player hasn't yet moved at all) all solutions are exported. If the player has already moved only the current move history is saved. This is the same as the previous menu item except that the level is saved as it is shown on the screen (which may be flipped or rotated). If the level is rotated or flipped, the solutions and move histories, which also are exported to the clipboard, will be converted accordingly. Jumps to the next level of the collection. If there are any unsaved changes of the current level, a dialog is shown asking whether the changes of the current level are to be saved before switching to the next level. If there is no further level in the collection, the first level of the collection is loaded. Jumps to the previous level of the collection. If there are any unsaved changes of the current level, a dialog is shown asking whether the changes of the current level are to be saved before switching to the next level. If there is no previous level in the collection, the last level of the collection is loaded. Jumps to the next unsolved level of the collection. If there are any unsaved changes of the current level, a dialog is shown asking whether the changes of the current level are to be saved before switching to the next level. If there is no further unsolved level in the collection, the first unsolved level of the collection is loaded. Jumps to the previous unsolved level of the collection. If there are any unsaved changes of the current level, a dialog is shown asking whether the changes of the current level are to be saved before switching to the next level. If there is no previous unsolved level in the collection, the last unsolved level of the collection is loaded. Opens a dialog where you can enter the number of the level to jump to.